Making a handmade ornament with the kids can be a lot of fun for the holiday season! 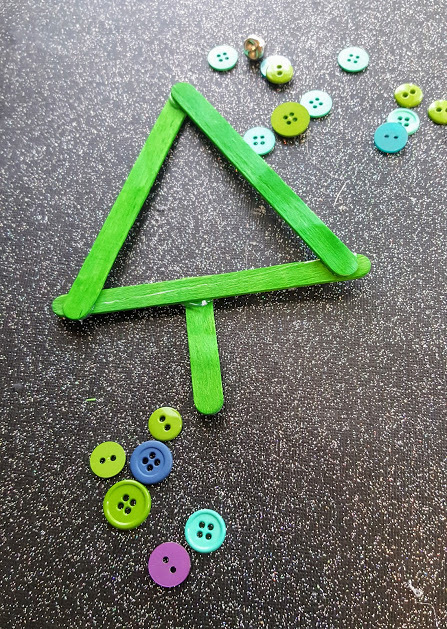 These button trees are so easy to make and adorable for gifting something handmade from the heart this Christmas. Everyone loves a kid made ornament to display on their tree! Last weekend I found a great deal on dyed craft sticks! 80 for $1. What a bargain! This inspired us to make a ton of fun craft stick ornaments to share this holiday season. I am going to be bringing them to you, so that you can make something cute with your kids to share with friends and family. These kid made Christmas ornaments came together in just a few moments. 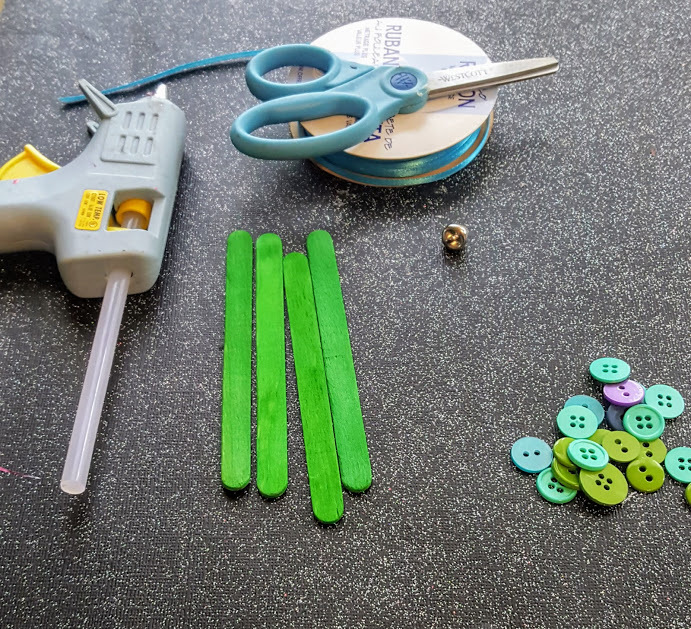 We used hot glue for instant gratification, but you can use white or PVA glue if you have patience! 4 craft sticks, I used green. 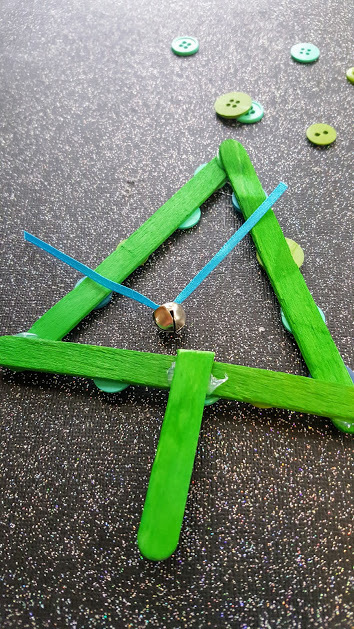 Make a triangle shape and glue it together. With your remaining stick, cut it in half. This will be your tree base. Glue it on the bottom. 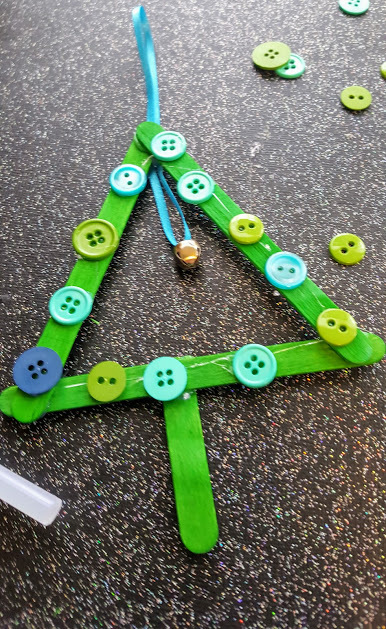 Glue buttons on to the tree in any pattern you prefer. We used blue and green for this ornament and loved the way it turned out! Flip the tree over. Thread a small bell on the 4" section of thin ribbon. With the bell in the center, glue it on the tree so that it dangles to the middle section of the tree. With the other 3" of thin ribbon make the loop for hanging from the tree! Now your button tree ornament is finished. Hang it from your tree, attach it to a wrapped gift, or share with someone special! This was a cute and fun project to make with Rolf. We love kid made ornaments and have several other variations of this to show you over the coming weeks. From my family to yours; Happy Holidays!